So he rose and entered into that household of his. Who’d given this authority to mortals. καὶ ἦλθεν εἰς τὴν ἰδίαν πόλιν. καὶ ὕπαγε εἰς τὸν οἶκόν σου. τὸν δόντα ἐξουσίαν τοιαύτην τοῖς ἀνθρώποις. 2 Joshua is used (not Yeshua), since this is a Greekified transliteration of the name given to Moses’s assistant in the Septuagint. The Greek phrase πίστιν is rhetorical, is the proof, the certitude, the credibility, or incarnated or embodied by the enthymeme according to Aristotle. 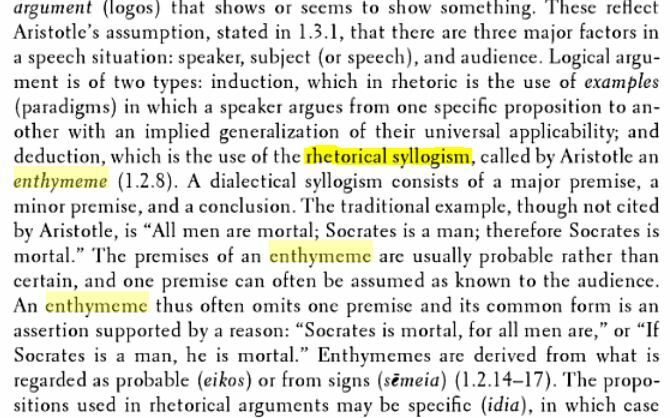 4. ἐνθυμήσεις and ἐνθυμεῖσθε are taken as forms of the rhetorical enthymeme – a rhetorical syllogism with implied or even missing premises. The reader looking should just understand. The enthymeme works somewhat like an inside joke. To explain it publicly for all is to ruin it. To “get it” as one of the insiders (wink wink) is half the fun. 5. περιπάτει. This is Matthew’s play against παραλυτικὸν. In other words, someone who walks around is not someone who cannot walk as a cripple. And I’ve transliterated it as Peripatetics, since it’s how Aristotle’s students came to see things he taught them. They learned as they followed him, literally, walking around his academy with him. Matthew’s readers would have gotten this. Well, if they didn’t, then they do now (don’t we?). 6. and 8. ἀνθρώπου and ἀνθρώποις – I’ve translated these as “mortals” because the context shows these “on these earth” and in relation with τὸν θεὸν (God) who is above and has power and authority. This poem and this post rely on some of the information in the previous post, where I discussed the NA28 Greek and the enthymeme of the German Bible Society that has made it so freely available as the Word of God.